MERIDA, Mexico, March 14 — President Bush expressed confidence in Attorney General Alberto R. Gonzales on Wednesday, but agreed that “mistakes were made” in the dismissal of eight federal prosecutors, and said it “troubles me” that lawmakers feel his administration was not straightforward. As he wrapped up a six-day, five-nation tour of Latin America, Bush found himself again forced to confront a political furor back home. He took time out from his Mexican schedule to call Gonzales Wednesday morning and instruct him to go to Capitol Hill to repair his credibility problems with Congress. But Bush denied that politics drove the decision to fire the U.S. attorneys. VIDEO | Attorney General Alberto Gonzales accepted responsibility Tuesday for the way eight federal prosecutors were fired. View continuing Post coverage of December 2006 firings of eight U.S. attorneys. Yesterday, Gonzales said he does not regret firing the eight prosecutors but he accepted responsibility for “mistakes” that triggered a congressional probe into whether White House officials and other Republicans exerted political pressure in the dismissals. The president offered his first account of his own role in the matter, saying he heard complaints about U.S. attorneys from fellow Republicans and informed Gonzales about them but did not tell him to fire anyone. Bush recalled visiting Senate Republicans on Capitol Hill and hearing them grouse about prosecutors, although he said he did not believe they mentioned specific names. And other members approached him on other occasions, he said. The dispute over the dismissed prosecutors intruded on Bush’s foreign tour for the second day, absorbing much of the discussion at the trip’s final session with reporters and taking up his aides’ time as they coordinated information and talking points with colleagues back in Washington. Bush did not appear happy to be addressing the matter when he would rather have focused on his talks with CalderÃƒÂ³n about immigration, trade and drugs, but acknowledged that he would ask the same questions. He tried to strike a balance between defending his administration’s underlying actions while agreeing that his aides bungled the way they informed Congress. Republican lawmakers as well as current and former administration officials have been exasperated at what they consider a self-inflicted political wound. The Justice Department and White House have provided shifting explanations about why the U.S. attorneys were pushed out and who was involved. The initial version suggested the prosecutors were poor performers, but it soon became clear some of them were given positive evaluations but that Republican lawmakers had lodged complaints in connection with politically sensitive cases. At his news conference in Mexico, Bush noted that he has the power to remove U.S. attorneys and that other presidents have used it as well, calling it a “customary practice.” But presidents typically replace political appointees at the beginning of an administration, and veteran law enforcement specialists said they could not recall so many U.S. attorneys being removed at once in the middle of a term. Bush brushed off calls by Democrats to replace Gonzales, a longtime friend and adviser going back to their days in Texas. “I do have confidence in Attorney General Al Gonzales,” the president said. 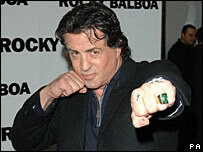 Stallone, who was in Australia to promote recent film Rocky Balboa, faces a possible fine of A$22,000 (Ã‚Â£8,930). 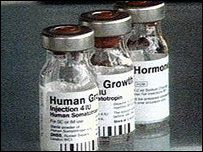 The muscle-building hormone product, Jintropin, is classed as a performance enhancing drug in Australia. Such products cannot be imported into Australia without a special permit. Prosecution documents handed to a Sydney court on Tuesday said Stallone had marked “no” on a customs declaration form that asked if he was bringing restricted substances into the country. But an X-ray of bags belonging to his entourage uncovered the bottles of Jintropin, which is made by Chinese firm GeneScience pharmaceuticals. “You have not been validly prescribed the goods by a medical practitioner for any medical condition suffered by you and for which the goods are recognised medical treatment,” Stallone was told in a customs document submitted to the court. Stallone and his team were held at Sydney airport for several hours following the discovery. The maximum penalty for the offence is A$110,000 (Ã‚Â£44,639) and a five-year prison sentence – Stallone faces a lesser fine because the case is being prosecuted in a local court. The actor was not present to hear the charge against him at Tuesday’s hearing. He is thought to be in Thailand, where he is making his fourth Rambo film. At the time, Stallone dismissed the incident as a “misunderstanding”, adding that customs officials were “just doing their jobs”. “I just didn’t understand some of the rules here,” he explained. Scenes of bullying and torture in ITV soap Coronation Street have been cleared by TV watchdog Ofcom after more than 30 viewers complained.An episode shown last October featured womanising builder Charlie Stubbs tying up teenager David Platt and forcing his head under water. Ofcom received 31 complaints saying such scenes were unacceptable before the watershed and might be imitated. But Ofcom decided the scene was “editorially justified”. ITV1 insisted the audience knew that Charlie, played by Bill Ward, was a womanising bully and were prepared for the confrontation. The broadcaster said the words “Charlie has a nasty surprise for David” before the programme hinted at what was to come. The episode had Charlie luring David, played by Jack Shepherd, into a flat to exact revenge for weeks of taunting over an affair. But it added that the broadcaster could have given more warning about the violent content before the episode was aired. The Windows Live brain drain continues as news sources are reporting that Windows Live Search vice president Christopher Payne will be stepping down shortly. The Wall Street Journal says sources are indicating that Payne will be leaving the company to start his own business, and that Microsoft has not yet decided on a successor. Microsoft is so far declining to comment on the reports. Payne’s departure would follow that of Blake Irving, who is set to retire. Irving was the vice president of the Windows Live platforms group and became the public face of the initiative to many in the tech community. It may also signal more serious trouble within the unit. Windows Live Search has steadily been losing share in most surveys, and the overall brand has seen several services either be cut or end up being switched to the better-known MSN brand in an attempt to keep them alive. This follows a dizzying period where as many as three dozen different Live-branded projects were in development at one time. Last year, at a gathering in Redmond for bloggers and MVPs, many commented after the event about how the Windows Live effort seemed to lack direction. Some caution, however, on focusing too much on Windows Live’s revolving door. “Although Microsoft seems confused and directionless, they are undoubtedly treating Windows Live as their long-term strategy to challenge Google,” Windows Live watcher Chris Overd said, who runs the Web log LiveSide.net. “The loss of these key executives is not as important as the individuals they choose to replace them, especially with Search being such an uphill struggle,” he continued. Payne worked with Microsoft on Access during the 90s, but left for three years to work with Amazon.com. In 2001, he returned to the company, and most recently oversaw Microsoft’s online search division. He played a major role in convincing Microsoft to invest in its own search technologies.